Sri Krishna avathar is compleately Divine.In this avathar Lord Krishna gave Bhagavat Gita to mankind a compilation that is a religious classic with pro found phylosophical thoughts. Gita has taught many things to mankind to lead a life of love, affection,devotion,duty toparents,duty to country etc.God Sri Krishna says he liberates mankind from their sins when they completely surrender to him and helps them attain perfection. He also says in Gita "abandoning all rites and duties take refuge in mealone. Do not grieve for I shall librate you from all sins. Aside to the story of Krishna avathar: In the mean time Sri vishnu ordered Aadhi-sesha his five-hooded snake to go into Devaki'swomb to be the seveth child. But He said this child would in time be transfered to the womb of Rohini the first wife of Vasudeva and would be born as Balarama another avathar of theGod. God again ordained that Yokamaya Shakthi would be born as a girl child to Yasoda a lady in the yadava clan in Gokulam at the same time when Sri vishnu would be bornas Lord Krishna to Devaki. When Devaki gave birth to Lord Krishna God ordered Vasudeva to take the baby to Gokulam leave it with Yasoda and bring the female child born to Yasoda to the prison to be with Devaki. By Gods will the jail gates unlocked by them selves, the guards fell asleep to facilitate Vasudeva to take the child to Gakulam as divinely ordained. Further the river Yamuna which was in spateparted to open a path for vasudeva to pass with the child on his head. It was raining also. By Gods instruction a five-hooded snake opened its hood like an umbralla over the child to protect it fromthe rain. He reached to gokulam and exchanged the children and he came back to the jail with Yogamaya born as a female child. The doors closed and locked itself automatically. All the gaurds woke up from deep slumber. As soon as he left the child with devaki Immediatly the child began to cry. The guards immediately in formed to Kamsa that a child was born to Devaki. Kamsa immediately went to the jail and was surprised and confused to find that the eighth child was a baby girl.However he snached the baby and dashed it head against the jail wall. The baby rose up and appeared as Devi Yokamaya and said "Homerciless king why are you trying to kill me ? The one to kill you is already born and is growing up some were. You cannot escape from death." saying this Yogamaya disappeared. Kamsa was stunned and went to his palace a worried person. He felt very rest less. In the mean time grand celebrations were going on in Gokulam over the birth of Sri Krishna. Kamsa heard about this and sent his men to Gokulam to find out how many children were born with Rohini as their zodiac star. They went to Gokulam and found that 25 such children were born and informed Kamsa accordingly.They also told him that grand celebrations were going on in one Nanda gopan's house Kamsa some how felt very uncomfortable about the birth of Krishna to Nanda gopan and Yasoda and tried various means to kill the child but did not succeed. In time Lord Krishna killed the cruel king. & release his parents Vasudevan & Devaki and they sent young Krishna to a hermit for 'gurukula-vasam' for hisformal education. 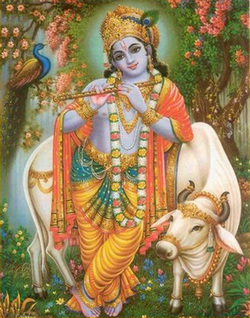 Krishna learnt all the sasthras and all the arts.On finishing his education he shifted to Dwaraka from Madhura. He distroyed all the evil forces and and established Dharma. Krishna helped the 'Pancha-pandavas' the five brothers among whom Arjuna was Krishna's very close friend. He helped them win the war with 'Kowrawas' the evil 100. During the war between the'Kowravas" and the 'Pandavas' Lord Krishna gave the message of SriBhagvat Gita to Arjuna and to the world.The essance of Gita: The Bhagavad-Gita describes to us how the aspirant to the heaven savoids bodily excesses and indulgence and practices abstinence. without attachment or desire for reward, has shown the way of life for all human rich or poor learned or ignorant - those who seek lightin the darkness of the problems of life.